Two new sweetener tablets have arrived on the supermarket shelves recently. 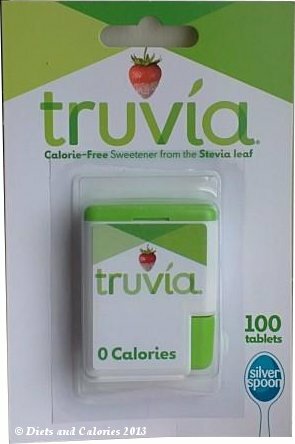 There's one from Hermesetas called ‘Stevia Blend’ and another from Truvia which is a welcome addition to their range of natural calorie free sweeteners. Both sweeteners are completely free from calories and can help with weight loss as part of a calorie controlled diet. 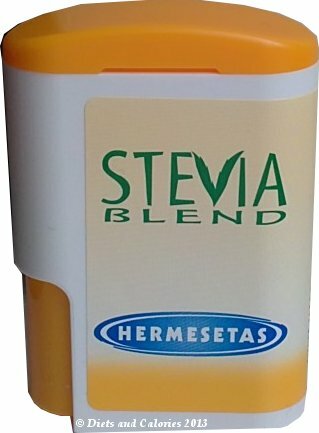 Hermesetas have already brought out their own Stevia based sweetener called Stevia Sweet. This is made using only Stevia as the sweetening ingredient, so it's a natural sweetener. Hermesetas Stevia Blend, however, is made using a mix of both Stevia and Sucralose. This combination is ideal for those who haven’t quite got used to the particular kind of sweetness that stevia provides, but are happy with the sugar like sweetness of sucralose. 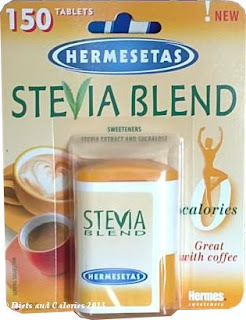 Hermesetas Stevia blend has zero calories per tablet and is equivalent to one teaspoon of sugar in sweetness. It's ideal for use in hot drinks and is available in a 150 tablet dispenser pack. Ingredients: Lactose, Sweeetener: Steviol Glycosides, cross-linked CMC, Sweetener: Sucralose, L-Leucine. Suitable for diabetics. Truvia, by Silver Spoon, were one of the first sweetener brands to appear in UK stores which make use of the natural sweetening ingredient, Stevia. They also sell the most realistic sugar-like natural calorie free sweetener available in sachets and jars. Another relatively new addition to the Truvia range is called Silver Spoon Truvia Baking Blend 500g which is made from sugar and stevia. Now they have a calorie sweetener tablet which is perfect for use in tea and coffee. Each tablet is equivalent to one teaspoon of sugar in sweetness. Available in 100 tablet dispenser packs. Ingredients: Lactose (from milk), sweetener (steviol glycosides (stevia leaf extract); flavouring, stabilisers: cross-linked cellulose gum, magnesium salts of fatty acids. Suitable for vegetarians. Thank you for giving the information. I was searching the new flavor of sweetener in the market. Now it would be easy for me to buy the sweetener. Thanks Carol. Glad to help.